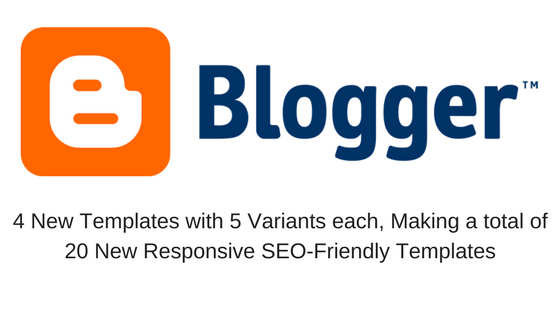 Blogger Came up with 20 New Variants of Responsive Blogger Themes - IT ADDA! Recently (in March 2017), Blogger launched its 20 new variants of Responsive, Well Designed and SEO-Friendly Blogger Themes after a really long time. I have been waiting for more than 3 years to see this happen. I am sure if you are a blogger then it’s the same with you and all the other blogger users. I used to think how Blogger can be so backward? After all, it’s a Google Product. So finally, here they come! 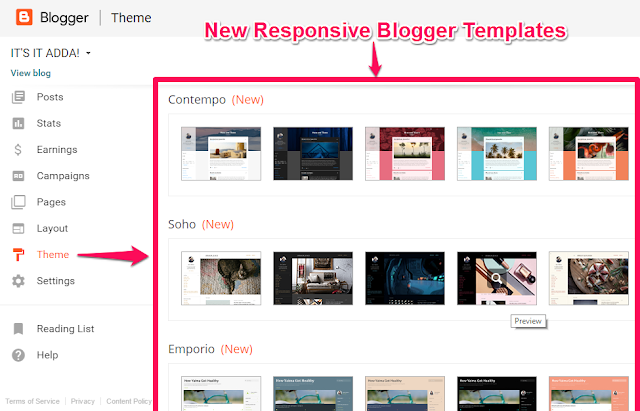 Recently this month, They introduced 4 New Themes namely Contempo, Soho, Emporio & Notable. Each one of them having 5 variants making a total number of 20 new responsive, well designed and SEO-Friendly templates or blogger themes. Well, this is the first new theme listed on the theme tab of blogger interface. Contempo is very simple and responsive template. I don’t think that there is any necessity to tell you that all of them are SEO-Friendly. It has a sidebar on the left and an Ad Space on the right. You can use Skyscraper Ad formats in this place to monetize your blog. The best thing about all these templates is they are modern and simple to use. This is again simple but modern designed and SEO-Friendly template.This template has a big feature image on its homepage as you can see on the screenshot preview above. Again similar specifications with a bit of tweak. It also well designed and SEO-Friendly template. In this template, the sidebar is on the right side as you can see in the preview above. The Ad Space is also on the right side along with the sidebar. You can use Skyscraper ad in that ad space to monetize your blog. This template has a Seach box at the top right side which stay along with title bar fixed at the top. Now let’s move on to the last one. The fourth one is called…. Well, this last one, I liked the most. I personally think that it’s the best one out of these 4, Especially for Writers or who wants to get noted as the author of the post. This template highlights the Author and makes him/her notable as its name. This template is also similar to above three in accordance with modern design and SEO-Friendliness. This theme also has a sidebar on the right side and a search box at the top. But, this theme doesn’t have the Skyscraper Ad space. However, you can manually insert the ads and monetize your blog. If you are overwhelmed with the title of the blog post above or want to check out the new theme, you can read that post here. So, that’s it for now. Don’t forget to tell me which one is your personal favorite on the comment box below. If you liked the post, share it with the peoples who might find it helpful for them. Thank you for reading this post. Have a good day! Next story 5 Amazing Android Photo Editing Apps, That you should know!